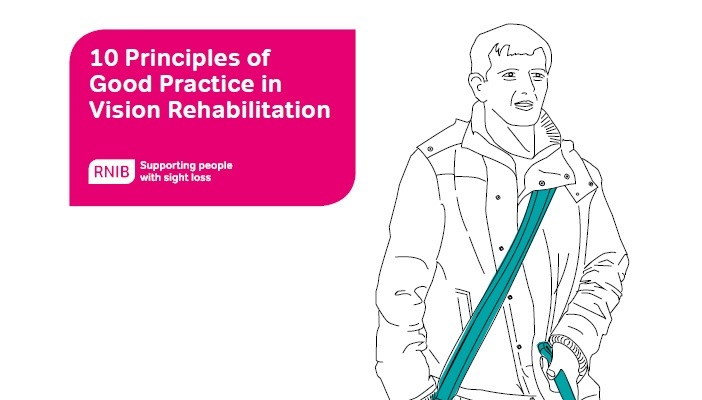 Eye health and sight loss charity launches new good practice guide for rehab workers supporting people with visual impairments. RNIB has produced the guide in consultation with over 130 sight loss professionals, blind and partially sighted people, VISION 2020 UK and members of the Rehabilitation Workers Professional Network (RWPN) to help standardise the service people receiving vision rehab should expect. Vision rehab provides training and advice to people who experience sight loss to learn and develop the right skills to be able to get around safely and continue to do the everyday activities, like preparing a hot drink or a meal and going to the shops. The guide outlines 10 principles of good practice and stresses the importance of timely contact with people affected by sight loss. Each principle is made up of components that explain what ‘good’ practice should look like to make vision rehab easier to understand. According to the principles, all people should have contact by telephone with their local authority within two working days of receipt of their Certificate of Vision Impairment (CVI); have a specialist face-to-face assessment within 28 days and a full community care needs assessment be carried out if more assistance outside of what rehab can offer is needed. RNIB’s 2015 My Voice research found that sadly one in five blind and partially sighted people never receive a visit from their local authority. Less than a third receive mobility training in the first year after experiencing sight loss. Currently, the rehab sector is not a recognised profession. As a result, there has been a lack of coherent support given to the 500 people working in rehabilitation worker positions and service delivery has been inconsistent. Miller, a previous rehab manager, is aware resources and budgets are a premium. She added: “The service is massively dwindling. We want the guide to be used by commissioners to make them aware of what resources they should be budgeting for”. For more information relating to the Early Intervention and Rehabilitation project, please contact Josh Feehan on [email protected] or Simmone Miller at [email protected].